You're a Good Man, Charlie Brown at Bloomington Civic Theatre is an energetic, fun, sweet, colorful, and downright adorable show. All I knew about this musical before I saw it is that Kristin Chenowith won a Tony for her role as Sally. 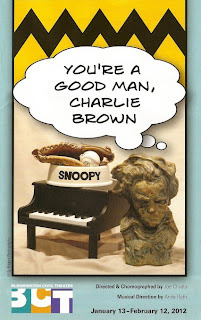 Based on the classic comic strip Peanuts by Minnesotan Charles Schultz, it was originally produced in 1967 and revived in 1999. There's not much of a plot to the show, it's more like a series of vignettes that bring to mind the comic strip. With just a six-person cast, this is the smallest show I've seen at the BCT. There's no room for weak links in such a small cast, and there are none here. Each character is a familiar friend, and these actors bring them to life in front of us. I happened to go on a "talk-back" day, which is always fun for me, and one of the actors commented that their characters are bigger, more exaggerated versions of themselves. I'm not sure if that's true, but it sure could be judging from their performances. Our Charlie Brown is Adam Qualls, who was so good as the baker in Into the Woods last year. He again does a wonderful job as our hapless hero, for whom nothing ever goes quite right. Adam's Into the Woods wife is now his adversary/friend Lucy. Colleen Somerville was last seen as one of the hilariously evil stepsisters in Cinderella at the Ordway, and is everything you'd want Lucy to be - relentless and pushy and selfish, and somehow loveable. Charlie Brown's cute, spoiled, and not very studious little sister Sally is played by Courtney Miner, who, as she joked in the talk-back, gives Kristin Chenowith a run for her money! She's adorable and fun to watch, especially chasing rabbits with Snoopy and in her big song "My New Philosophy." 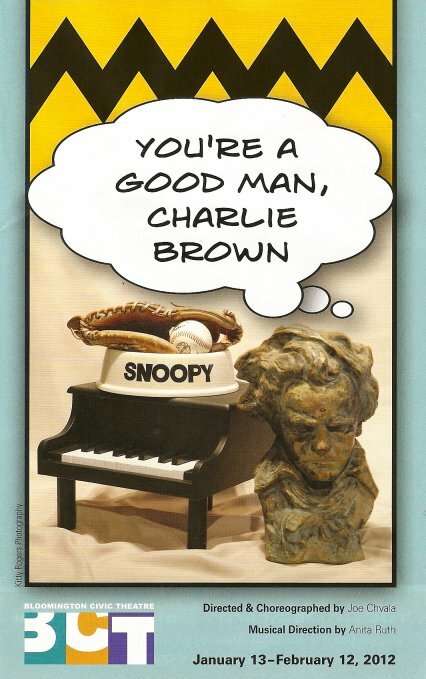 Also great are Andrew Newman as the blanket-carrying, thumb-sucking Linus, whose intelligence and eloquence contrast with his babyish ways; and Eric Heimsoth as the classical music obsessed Schroeder, who gets to sing one of the funnest songs, Beethovan Day! Last but not least, stealing every scene he's in, is Tyler Michaels as Snoopy. He completely inhabits this canine character with great physicality and energy, in the way he moves and dances as well as how he reacts to what's going on around him. He said in the talk-balk that he studied physical theater, which is obvious in his performance. According to Tyler's website he will soon be playing my favorite character, Moritz Stiefel, in the highly anticipated (by me) Spring Awakening by Theater Latte Da. It's the first bit of casting news I've seen, and I'm very excited to find out that someone I now know and like will be playing my sweet, troubled Moritz. A few more great things about the show: colorful, oversized children's clothing that makes the adult actors look like kids; cartoonish sets that look like the comic strip come to life; delightful, childlike choreography by Joe Chvala who also directed; and really fun, catchy songs accompanied by the fabulous six-person pit orchestra led by Anita Ruth. I saw a lot of kids in the audience who seemed to be having a good time, but the Peanuts characters are timeless and relatable at any age. The final song is the familiar refrain "Happiness is...", listing all the wonderful and seemingly trivial little things that add up to make life worth living. This production definitely captures the bittersweet life-is-tough-but-wonderful feeling of the comic strip. I saw my first show at BCT just last year, and it kills me that I missed some of my favorites (like Light in the Piazza and Urinetown) in previous years. Longtime Music Director Anita Ruth talked about how BCT is a stepping stone for young actors between college and some of the bigger stages around town. Most of the actors have "day jobs," and the experience they receive at BCT is invaluable and will surely lead them to bigger things. BCT seems to be the place to spy young up-and-coming talent, in addition to seeing some great theater.